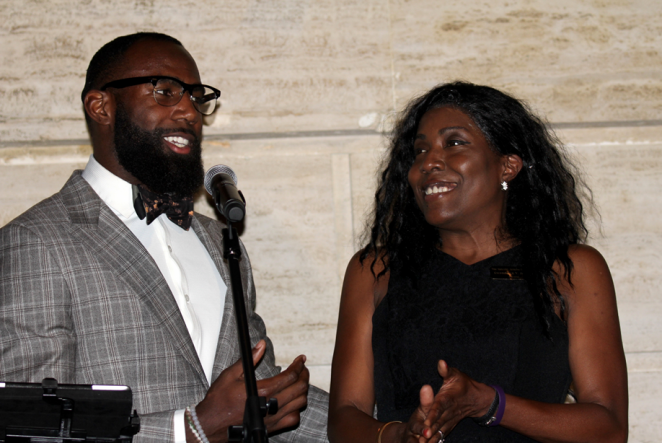 On November 2, Philadelphia Eagles Free Safety Malcolm Jenkins hosted The Malcolm Jenkins Foundation’s (TMJF) 2nd Blitz, Bow-Ties & Bourbon fundraiser. Fueled by tasting menus from local chefs, upbeat music, and live and silent auctions, the event raised nearly $50,000.00 to support the Foundation’s efforts to expand its youth programs and initiatives to the Greater Philadelphia region. With NBC10 evening news anchor Jacqueline London at the helm as emcee, the passion in the room rivaled that of any home game. Also at Jenkins’ side were his wife, Morrisa, mother and TMJF President Gwendolyn V. Jenkins, father, W. Lee Jenkins; family, friends and several of his Philadelphia Eagles teammates including Linebackers DeMeco Ryans and Emmanuel Acho, Outside Linebackers Connor Barwin and Brandon Graham, Wide Receivers Jordan Matthews and Jonathan Krause, Safety Chris Maragos, and Placekicker Cody Parkey. The air was thick with the aromas of dishes prepared by Chefs Michael DeLeone of La Castagne, Rob Gary of The Capital Grille, Francis Hagan of Sbraga Dining, Thomas Harkin of Bank and Bourbon, Josh Lawler of Farm and Fisherman, Luke Palladino of Palladino’s, and Chip Roman of The Roman Restaurant Group, complemented with bourbon tastings by Angel’s Envy and Millstone Spirits Group’s New Liberty Distillery. Blitz, Bow-Ties, & Bourbon was made possible through the generosity of the Foundation’s sponsors and donors including Piascik, Customers Bank, Ms. Adrienne Shelton, Eagles Youth Partnership, The Ohio State University, Merrill Lynch DJ Sound & Lighting Inc., CSM, G2G Collection, Robbini Bespoke, Rock Avenue Bow-Ties, and ToBox Shoes.